Tom Tarantino, now at El Camino, has seen former assistant coaches win San Diego Section titles. OCEANSIDE  Tom Tarantino has always surrounded himself with good people. 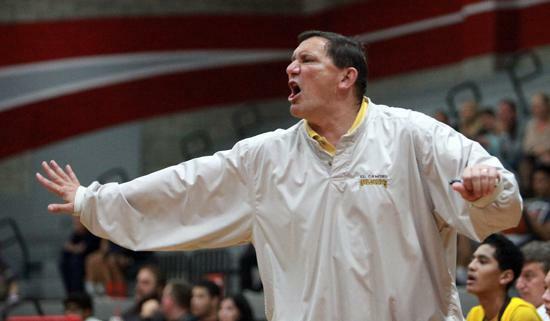 “Hire good assistants and let them coach,” said Tarantino, 55, now in his second year as boys basketball head coach at El Camino High and in his 20th year in San Diego County. “I want input from my assistants — have an opinion on players, how practices are run, game strategy. The seeds of that philosophy were sown when Tarantino played at Holy Trinity High in Hicksville, N.Y., for Bob McKillop, now the head coach at Davidson. From those experiences sprouted Tarantino’s coaching tree, a tree with branches in New York and California. “Tom is my basketball mentor,” said La Jolla Country Day head coach Ryan Meier, who served as an assistant under Tarantino at Carlsbad. Meier is in his 10th season at La Jolla Country Day with a San Diego Section Division IV title in 2011-12. Meier’s team this year is 22-3 and ranked No. 10 in the county. “Unless you’ve worked with Tom in practice, see how intense he is, how dedicated he is, but how he simplifies things, you won’t know how good he is,” Meier said. “People enjoy being around him, gravitate to him. He has charisma. “Certainly X’s and O’s are important. He adjusts his system to his players, not the players to the system. He let’s his players be players. El Camino senior guard Luke Arvidson played a season under legendary coach Ray Johnson before Johnson took a job as an assistant coach at Loyola Marymount. Arvidson — whose father, Phil, coached for Johnson and is now assisting Tarantino — is one of the leaders of this year’s El Camino team, which is 19-5 and ranked No. 5 in the county. “He knows every player’s strength and weakness,” Luke Arvidson said of Tarantino. “I didn’t know him before he took the job here, but I learned his first summer that he was a man I could play for. “His shooting workouts, his drills, his sprints, his intensity were all great. Tarantino won a New York state championship at St. Dominic, where he was an administrator at camps run by then New York Knicks coach Rick Pitino. After bringing his team to the Torrey Pines tournament for several years, Tarantino was lured to the West Coast, where he took the job at Carlsbad. He won a San Diego Section Division I championship with the Lancers in 1999-2000, beating El Camino 59-57 in double overtime. Tarantino took Bishop’s to four Division IV title games, winning in 2000-01 and 2008-09. He led Army-Navy to a Division IV championship in 2012-13. “I learned the pace of practice from Tom,” said Army-Navy coach Bobby Huggins, an assistant under Tarantino. “He doesn’t just run drills, he lets the players know what they mean. The drills are quick, run at full speed. “There is no down time in practice. One of those is Kamal Assaf, who worked with Tarantino at Bishop’s, then led La Jolla to Division III championships in 2007-08 and 2008-09. “I spent four years with Tom, and it was like going back to college,” said Assaf. “Every good coach knows the game, but Tom is a wonderful educator. “He gets kids to work hard and love it. Kids know he’s genuine. “He’s there to make them better basketball players, but he’s also there to teach them how to be better sons, husbands and fathers. Arvidson has been at El Camino for 20 years. Roerig is in his 14th season. “Todd and I, all El Camino basketball fans, are extremely happy Tom was available and took this job,” Phil Arvidson said. “He has been a perfect fit. “He’s very easy to work with because he takes input. His energy is infectious. He goes nonstop. 1985-1996 — Tarantino is boys basketball head coach at St. Dominic High, Oyster Bay, N.Y.
Assistant Rob Pavinelli replaced Tarantino as head coach, winning several Long Island championships and a New York state title. Assistant Jim Fox became head coach at Appalachian State after 13 years as an assistant for Bob McKillop at Davidson. 1997-2001 — Tarantino is head coach at Carlsbad High. Assistant Ryan Meier is now the head coach at La Jolla Country Day, winning a San Diego Section Division IV title in 2011-12. Meier’s assistants have included Chris Featherly (Orange Glen), Dante Carey (San Marcos) and Nick Levine (Bishop’s). Featherly guided the Patriots to the Division IV championship in 2013-14. 2001-2009 — Tarantino is head coach and athletic director at Bishop’s. Assistant Kamal Assaf became the head coach at La Jolla, where he led the Vikings to Division III championships in 2007-08 and 2008-09. Luke Stuckey, Assaf’s assistant at La Jolla went on to be the head coach at San Dieguito, jumped to the NBA’s Orlando Magic and is now an assistant coach at Cameron University in Oklahoma. Assistant Matt Niehues became the head coach at Bishop’s and won the Division IV title in 2010-11. Assistant Marshawn Cherry became an assistant at Army-Navy. 2009-2014 — Tarantino is head coach at Army-Navy. Assistant Bobby Huggins replaced Tarantino as head coach at Army-Navy. Assistant coach Sam Eshelman started the program at Sage Creek and is now back at Army-Navy as an assistant. 2014-2016 — Tarantino is head coach at El Camino. Assistants are Phil Arvidson and Todd Roerig.